Dragons are one of the most popular mythological creatures. The descend from various legends, telling tales of fire-breathing, winged creatures. There are two different dragons that you’ll commonly see- the Eastern and the Western dragons. The Eastern dragons of the orient are seen as benevolent creatures who are the protectors of life, fertility, and good fortune. The Western dragons tend to be the evil creatures that destroy villages and guard hoards of treasure. As a tattoo, dragons are usually represented in the form of the Eastern dragon and of oriental styles. Dragon tattoos are normally seen in black and commonly drawn with flames and fire. But, Japanese and Chinese dragon styles are usually pretty ornate and can be in color or black and white shades. 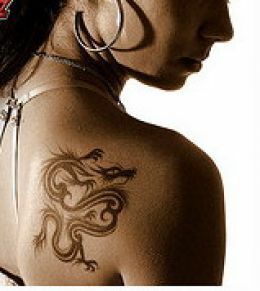 It’s up to you as to what dragon style you choose for your tattoo. among both men and woman, each person finding a different reason and symbolism behind the dragon. Dragon tattoos can have different meanings to different people. It’s all depending on how you see the mythical creature and as to what design you choose. Many men tend to associate with the dragon which is why they get dragon tattoos. Some men see themselves as guardians over loved ones, so since the dragon tends to symbolize protection, it fits the mold of a guardian. Because woman are those who give birth, they can be seen as a creator of life. Women can associate with the dragon in terms of protection and children; in most cases, mothers will protect their children till the end. Women may see the strength of the dragon and see it embodied in themselves. For the most part, there are many different meanings of a dragon tattoo, so each individual and each dragon will represent something a little different.